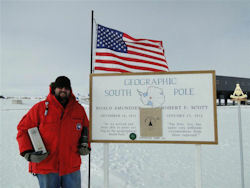 THE richly-sherried GlenDronach single malt is savoured worldwide but, in what must be some kind of a record, we’ve just heard of some fervent American fans…at the South Pole! Thanks to GlenDronach’s New Zealand agents Whisky Galore, a team of intrepid American scientists survive sub-zero temperatures down there thanks to some invigorating bottles of GlenDronach fifteen-year-old. Whisky Galore’s owner Michael Fraser Milne explains: “The United States Antarctic Programme (USAP) is an organisation that heads up scientific research and support on Antarctica. For many years, Whisky Galore has been a proud supporter of the scientists and crew who fly down to the ice from Christchurch where we’re based. “We like to make sure they're staying warm with a good dram or two, and the 'ice people' as we know them are very loyal fans of Whisky Galore. Michael is the proud owner of Whisky Galore, New Zealand's premier whisky supplier. He is originally from the Strathspey area of Scotland and has been involved with whisky for most of his life.